Since our exclusive interview with Virginia Attorney General Mark Herring on December 18 – during which Herring announced, “At this point going forward I’m not going to accept contributions from state-regulated monopolies or their registered lobbyists or key executives” – I’ve been very curious to see whether more Democrats would publicly break with Dominion Energy. On that note, just today we had two significant developments. Next, see below for the newsletter I just received from Del. 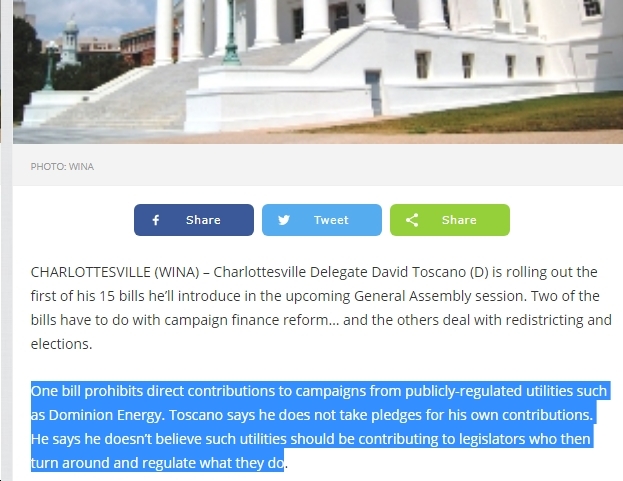 Paul Krizek (D-Fairfax), who says that he is now “refusing future campaign donations from Dominion Energy,” after having done so in the past. Del. Krizek adds his acknowledgement that – again, as people like me have been saying for years – “such donations contribute to public distrust in government and feed the narrative that the energy monopolies control the legislative body” and that “it erodes the public trust that you could be in a position to regulate a state run monopoly that is also contributing to your campaign.” Exactly! So again, whatever the reason(s) for this shift, I’m glad to see it – thanks to Del. Krizek!